While 22 people were killed in flash floods across Arizona, I was out at the same time chasing these sudden floods. This book is the result, a series of reconstructed episodes matched with personal experiences in the aftermath of sudden catastrophic events. 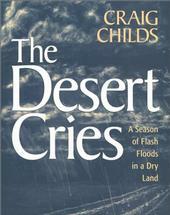 Flash floods spread violence and fear over the land. And yet, they sometimes bring peace and grace. You will meet survivors whose stories explain such a paradox. Gripping stories of five flash floods that raged in the Grand Canyon and elsewhere in Arizona within a two-month span.